1. After 2 years working on a project on sports and healthy life, teachers from partner schools in Italy, Poland, Spain, Germany, Belgium and Turkey have a common dream: promote the Eat by the Colour philosophy and encourage children, teenagers and their families to put more colourful foods in their staple diet. 3. The European commission says "yes" so in each partner country teachers and students join forces and establish a Comenius Team. Teams meet regularly, and study on the main theme of the project, collect ideas to share during the international meetings, prepare presentations and workshops and attend relevant events. 4. During the lifetime of the project the national teams meet - each time in a different country - for a whole week. They get to know each other, they share the results of the work performed at home and they prepare future activities. They are challenging moments since everyone has to make an effort to communicate in another language and adjust to different habits and lifestyle. Challenging but extremely rewarding. READY STEADY ... GO !!! The different national groups meet for the first time and share presentations on their own country, their city and their school. During the visit the partners discuss the project logo and the students make some important experiences: they learn how to make butter at a local farm, they think about the impact that advertising has on the food you choose, they visit one of the oldest chocolate factories in the country (Charlemagne Chocolatier), and they explore Brussels and Maastricht - two key places for the history of the European Union. THE "SHOP AND EAT BY THE COLOURS" TEAMS GO ON TV !!! During the week in Poland the Comenius students meet pupils from two local primary schools to propose "colourful snacks"; they take part to a flash mob in the city center with a group of traditional dancers and are filmed and interviewed by the local TV; they also take part to an exhibition on healthy and natural products . 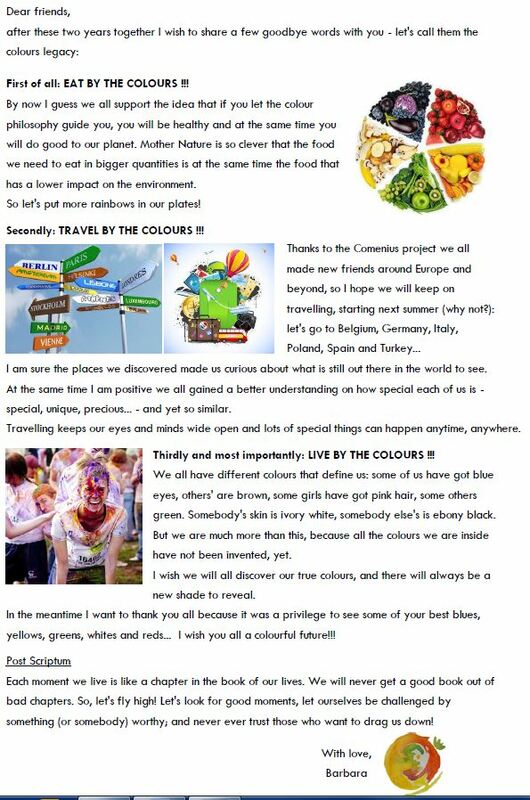 The Italian Team delivers an open lesson to students and teachers from other local schools on the Colour Philosophy and the importance of Phytonutrients. In Krakow, the group discovers the kosher food, and the history of the local Jewish community. Another significant moment is the visit to Auschwitz, a place that everyone should visit at least once in their lives. The mobility to Turkey starts with a weekend in Istanbul: spectacular! The young Italians discover every corner of the city along with the Spanish friends: spices, colorful food, new flavors. Once in Adana all the guests are given a warm welcome by the families. At school works begin with an exchange of opinions and studies on the major feeding mistakes and they continue with a green activity: planting seeds in the school Comenius garden. In Adana the partners finally agree on the Project logo - very cool ! At the end of the week, trip to Cappadocia, to admire the monasteries of Göreme and the Fairy Chimneys. The week begins with a morning at Aquam sports center in Oleggio with games and activities to create a team spirit. At school the foreign guests meet some classes, experience how to make centrifugates, taste colorful dishes, prepare home-made pasta, and participate to some challenges in the Masterchef style. One afternoon we all go to discover the hilly wine country between Ghemme and Sizzano, and visit the Cantalupo winery and Francoli distillery + enjoy "pane e salame" offered by Ghemme tourist board. A full day in Milan offers the opportunity to visit the exhibition "Van Gogh and the Earth". Special partecipation to the International Food Fair "Salone del Gusto" in Turin, guests of the stand of the city of Novara. EVERYBODY TO THE FARM ! During the German week we learn the way a German Organic Farm is run, we discover the secrets of chocolate , beer ... and Porsche cars! Together the students do their shopping and cook with organic and healthy products. We begin with a scientific experiment on the perception of food through color prepared by the students attending the Philosophy course. We follow the footsteps of Don Quixote and Sancho Panza in the streets of El Toboso and face the wind force nine to see the windmills of Mota del Cuervo. We discover the charm of Toledo and we all feel more united, like the inhabitants of this beautiful city who got along well with each other for 400 years no matter their religion. We learn to calculate the calories of churros and chocolate (tasting course), and experience new hairstyles with the trainee hairdressers - definetely a different way of being colourful ! We finally say goodbye... hoping for new opportunities to work together. 5. In Italy the team meets class 4B (now class 5B) from Art School Casorati that joins the project by designing Art works, posters, videos and visual aids to advertise the project message and content. A great job! 7. Novara-Kielce Twinning: A small group from Italy travels to Poland in order to add an international flavour to the activities (Kielce 2). 8. In each country the Comenius teams keep on exploring their territories in order to draw a list of colourful producers and prepare maps. 10. In June 2015 the project officially ends, but its ideas keep on moving people. The website is constantly updated and it will be used for future activities and educational initiatives. In some countries there will be a future event to present final results and encourage teachers from other schools to exploit the project outcomes and be inspired by the number of presentations produced.